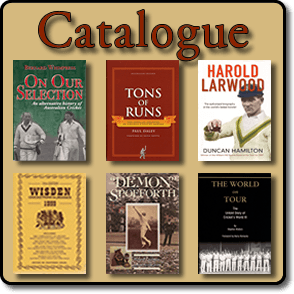 Roger Page Cricket Book Catalogue has now been released. It is available every two months. It contains a large range of cricket books on a wide variety of subjects relating to cricket. Roger’s cricket book catalogue is available online via the Internet, electronically via a pdf document through email and by hardcopy through the post. If you would like an electronic copy (soft copy) of Roger Page Cricket Books, please email Roger or complete the enquiry form on this website. To read a recent review of Roger Page Cricket Books can be found at the Cricket Couch. Unless otherwise stated, all books in good condition and bound in cloth boards. Books once sold cannot be returned or exchanged. G.S.T. of 10% to be added all listed prices for purchases within Australia. Please carefully read the postage and handling charges on the right sidebar. Overseas Remittances – bank drafts in Australian currency – should be made payable at the Commonwealth Bank, Greensborough, Victoria, 3088, Australia. Mastercard and VISA accepted.